Dawn entered orbit around Vesta on July 16, 2011, and completed a 14-month survey mission before leaving for Ceres in late 2012. It then entered orbit around Ceres on March 6, 2015. NASA considered, but decided against, a proposal to visit a third target. On October 19, 2017, NASA announced that the mission would be extended until the probe's hydrazine fuel supply was used up. On November 1, 2018, NASA announced that the Dawn spacecraft had finally exhausted all of its hydrazine fuel, thus ending its mission. The satellite is currently in an uncontrolled state about Ceres. The Dawn mission was managed by NASA's Jet Propulsion Laboratory, with spacecraft components contributed by European partners from Italy, Germany, France, and the Netherlands. It was the first NASA exploratory mission to use ion propulsion, which enabled it to enter and leave the orbit of two celestial bodies. Previous multi-target missions using conventional drives, such as the Voyager program, were restricted to flybys. SERT-1: first ion engine NASA spacecraft; launched on July 20, 1964. The first working ion thruster in the US was built by Harold R. Kaufman in 1959 at NASA's Glenn Research Center in Ohio. The thruster was similar to the general design of a gridded electrostatic ion thruster with mercury as its propellant. Suborbital tests of the engine followed during the 1960s, and in 1964 the engine was tested on a suborbital flight aboard the Space Electric Rocket Test 1 (SERT 1). It successfully operated for the planned 31 minutes before falling back to Earth. This test was followed by an orbital test, SERT-2, in 1970. Deep Space 1 (DS1), which NASA launched in 1998, demonstrated the long-duration use of a xenon-propelled ion thruster on a science mission, and validated a number of technologies, including the NSTAR electrostatic ion thruster, as well as performing a flyby of an asteroid and a comet. In addition to the ion thruster, among the other technologies validated by the DS1 was the Small Deep Space Transponder, which is used on Dawn for long-range communication. 26 proposals were submitted to the Discovery Program solicitation, with budget initially targeted at 300 million USD. Three semi-finalists were downselected in January 2001 for a phase-A design study: Dawn, Kepler, and INSIDE Jupiter. In December 2001 NASA selected the Kepler and the Dawn mission for the Discovery program. Both missions were initially selected for a launch in 2006. The status of the Dawn mission changed several times. The project was cancelled in December 2003, and then reinstated in February 2004. In October 2005, work on Dawn was placed in "stand down" mode, and in January 2006, the mission was discussed in the press as "indefinitely postponed", even though NASA had made no new announcements regarding its status. On March 2, 2006, Dawn was again cancelled by NASA. The spacecraft's manufacturer, Orbital Sciences Corporation, appealed NASA's decision, offering to build the spacecraft at cost, forgoing any profit in order to gain experience in a new market field. NASA then put the cancellation under review, and on March 27, 2006, it was announced that the mission would not be cancelled after all. In the last week of September 2006, the Dawn mission's instrument payload integration reached full functionality. Although originally projected to cost US$373 million, cost overruns inflated the final cost of the mission to US$446 million in 2007. Christopher T. Russell was chosen to lead the Dawn mission team. The Dawn mission was designed to study two large bodies in the asteroid belt in order to answer questions about the formation of the Solar System, as well as to test the performance of its ion thrusters in deep space. Ceres and Vesta were chosen as two contrasting protoplanets, the first one apparently "wet" (i.e. icy and cold) and the other "dry" (i.e. rocky), whose accretion was terminated by the formation of Jupiter. The two bodies provide a bridge in scientific understanding between the formation of rocky planets and the icy bodies of the Solar System, and under what conditions a rocky planet can hold water. 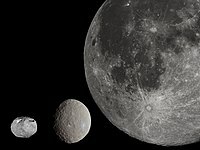 The International Astronomical Union (IAU) adopted a new definition of planet on August 24, 2006, which introduced the term "dwarf planet" for ellipsoidal worlds that were too small to qualify for planetary status by "clearing their orbital neighborhood" of other orbiting matter. Dawn is the first mission to study a dwarf planet, arriving at Ceres a few months before the arrival of the New Horizons probe at Pluto in July 2015. Ceres comprises a third of the total mass of the asteroid belt. Its spectral characteristics suggest a composition similar to that of a water-rich carbonaceous chondrite. Vesta, a smaller, water-poor achondritic asteroid comprising a tenth of the mass of the asteroid belt, has experienced significant heating and differentiation. It shows signs of a metallic core, a Mars-like density and lunar-like basaltic flows. Available evidence indicates that both bodies formed very early in the history of the Solar System, thereby retaining a record of events and processes from the time of the formation of the terrestrial planets. Radionuclide dating of pieces of meteorites thought to come from Vesta suggests that Vesta differentiated quickly, in three million years or less. Thermal evolution studies suggest that Ceres must have formed some time later, more than three million years after the formation of CAIs (the oldest known objects of Solar System origin). Moreover, Vesta appears to be the source of many smaller objects in the Solar System. Most (but not all) V-type near-Earth asteroids, and some outer main-belt asteroids, have spectra similar to Vesta, and are thus known as vestoids. Five percent of the meteoritic samples found on Earth, the howardite–eucrite–diogenite (HED) meteorites, are thought to be the result of a collision or collisions with Vesta. It is thought that Ceres may have a differentiated interior; its oblateness appears too small for an undifferentiated body, which indicates that it consists of a rocky core overlain with an icy mantle. There is a large collection of potential samples from Vesta accessible to scientists, in the form of over 1,400 HED meteorites, giving insight into Vesta geologic history and structure. Vesta is thought to consist of a metallic iron–nickel core, an overlying rocky olivine mantle and crust. The Dawn mission's goal was to characterize the conditions and processes of the Solar System's earliest eon by investigating in detail two of the largest protoplanets remaining intact since their formation. Although the mission has finished, the data analyses and interpretations will continue for many years. The primary question that the mission addresses is the role of size and water in determining the evolution of the planets. Ceres and Vesta are highly suitable bodies with which to address this question, as they are two of the most massive of the protoplanets. Ceres is geologically very primitive and icy, while Vesta is evolved and rocky. Their contrasting characteristics are thought to have resulted from them forming in two different regions of the early Solar System. There are three principal scientific drivers for the mission. First, the Dawn mission can capture the earliest moments in the origin of the Solar System, granting an insight into the conditions under which these objects formed. Second, Dawn determines the nature of the building blocks from which the terrestrial planets formed, improving scientific understanding of this formation. Finally, it contrasts the formation and evolution of two small planets that followed very different evolutionary paths, allowing scientists to determine what factors control that evolution. With its solar array in the retracted launch position, the Dawn spacecraft is 2.36 meters (7.7 ft) wide. With its solar arrays fully extended, Dawn is 19.7 m (65 ft) wide. The solar arrays have a total area of 36.4 m2 (392 sq ft). The main antenna is five feet in diameter. The Dawn spacecraft was propelled by three xenon ion thrusters derived from NSTAR technology used by the Deep Space 1 spacecraft, using one at a time. They have a specific impulse of 3,100 s and produce a thrust of 90 mN. The whole spacecraft, including the ion propulsion thrusters, was powered by a 10 kW (at 1 AU) triple-junction gallium arsenide photovoltaic solar array manufactured by Dutch Space. Dawn was allocated 247 kg (545 lb) of xenon for its Vesta approach, and carried another 112 kg (247 lb) to reach Ceres, out of a total capacity of 425 kg (937 lb) of on-board propellant. With the propellant it carried, Dawn was able to perform a velocity change of approximately 11 km/s over the course of its mission, far more than any previous spacecraft achieved with onboard propellant after separation from its launch rocket. However, the thrust was very gentle; it took four days at full throttle to accelerate Dawn from zero to 60 mph (96 km/h).Dawn is NASA's first purely exploratory mission to use ion propulsion engines. The spacecraft also has twelve 0.9 N hydrazine thrusters for attitude control (orientation), which were also used to assist in orbital insertion. First to orbit two different astronomical bodies (not including Earth). Solar-electric propulsion record, including a velocity change in space of 25,700 mph (11.49 km/second). This is 2.7x the velocity change by solar-electric ion drive than the past record. Achieved 5.9 years of ion engine runtime by September 7, 2018. This amount of runtime equates to 54% of Dawn's time in outer space. Dawn carries a memory chip bearing the names of more than 360,000 space enthusiasts. The names were submitted online as part of a public outreach effort between September 2005 and November 4, 2006. The microchip, which is two centimetres in diameter, was installed on May 17, 2007, above the spacecraft's forward ion thruster, underneath its high-gain antenna. More than one microchip was made, with a back-up copy put on display at the 2007 Open House event at the Jet Propulsion Laboratory in Pasadena, California. NASA's Jet Propulsion Laboratory provided overall planning and management of the mission, the flight system and scientific payload development, and provided the ion propulsion system. Orbital Sciences Corporation provided the spacecraft, which constituted the company's first interplanetary mission. The Max Planck Institute for Solar System Research and the German Aerospace Center (DLR) provided the framing cameras, the Italian Space Agency provided the mapping spectrometer, and the Los Alamos National Laboratory provided the gamma ray and neutron spectrometer. Framing camera (FC) — The framing camera uses 20 mm aperture, f/7.9 refractive optical system with a focal length of 150 mm. A frame-transfer charge-coupled device (CCD), a Thomson TH7888A, at the focal plane has 1024 × 1024 sensitive 93-μrad pixels, yielding a 5.5° x 5.5° field of view. An 8-position filter wheel permits panchromatic (clear filter) and spectrally selective imaging (7 narrow band filters). The broadest filter allows imaging at wavelengths ranging from 400 to 1050 nm. In addition, the framing camera acquired images for optical navigation while in the vicinities of Vesta and Ceres. The FC computer is a custom radiation-hardened Xilinx system with a LEON2 core and 8 GiB of memory. The camera offered resolutions of 17 m/pixel for Vesta and 66 m/pixel for Ceres. Because the framing camera was vital for both science and navigation, the payload had two identical and physically separate cameras (FC1 & FC2) for redundancy, each with its own optics, electronics, and structure. Visible and infrared spectrometer (VIR) — This instrument is a modification of the visible and infrared thermal-imaging spectrometer used on the Rosetta and Venus Express spacecraft. It also draws its heritage from the Saturn orbiter Cassini's visible and infrared mapping spectrometer. The spectrometer's VIR spectral frames are 256 (spatial) × 432 (spectral), and the slit length is 64 mrad. The mapping spectrometer incorporates two channels, both fed by a single grating. A CCD yields frames from 0.25 to 1.0 μm, while an array of HgCdTe photodiodes cooled to about 70K spans the spectrum from 0.95 to 5.0 μm. Gamma Ray and Neutron Detector (GRaND) — This instrument is based on similar instruments flown on the Lunar Prospector and Mars Odyssey space missions. This instrument includes 21 sensors with a very wide field of view. It was be used to measure the abundances of the major rock-forming elements (oxygen, magnesium, aluminium, silicon, calcium, titanium, and iron) on Vesta and Ceres, as well as potassium, thorium, uranium, and water (inferred from hydrogen content). A magnetometer and laser altimeter were considered for the mission, but were not ultimately flown. On April 10, 2007, the spacecraft arrived at the Astrotech Space Operations subsidiary of SPACEHAB, Inc. in Titusville, Florida, where it was prepared for launch. The launch was originally scheduled for June 20, but was delayed until June 30 due to delays with part deliveries. A broken crane at the launch pad, used to raise the solid rocket boosters, further delayed the launch for a week, until July 7; prior to this, on June 15, the second stage was successfully hoisted into position. A mishap at the Astrotech Space Operations facility, involving slight damage to one of the solar arrays, did not have an effect on the launch date; however, bad weather caused the launch to slip to July 8. Range tracking problems then delayed the launch to July 9, and then July 15. Launch planning was then suspended in order to avoid conflicts with the Phoenix mission to Mars, which was successfully launched on August 4. The launch of Dawn was rescheduled for September 26, 2007, then September 27, due to bad weather delaying fueling of the second stage, the same problem that delayed the July 7 launch attempt. The launch window extended from 07:20–07:49 EDT (11:20–11:49 GMT). During the final built-in hold at T−4 minutes, a ship entered the exclusion area offshore, the strip of ocean where the rocket boosters were likely to fall after separation. After commanding the ship to leave the area, the launch was required to wait for the end of a collision avoidance window with the International Space Station. Dawn finally launched from pad 17-B at the Cape Canaveral Air Force Station on a Delta 7925-H rocket at 07:34 EDT, reaching escape velocity with the help of a spin-stabilized solid-fueled third stage. Thereafter, Dawn's ion thrusters took over. After initial testing, during which the ion thrusters accumulated more than 11 days 14 hours of thrust, Dawn began long-term cruise propulsion on December 17, 2007. On October 31, 2008, Dawn completed its first thrusting phase to send it on to Mars for a gravity assist flyby in February 2009. During this first interplanetary cruise phase, Dawn spent 270 days, or 85% of this phase, using its thrusters. It expended less than 72 kilograms of xenon propellant for a total change in velocity of 1.81 km/s. On November 20, 2008, Dawn performed its first trajectory correction maneuver (TCM1), firing its number 1 thruster for 2 hours, 11 minutes. Dawn made its closest approach (549 km) to Mars on February 17, 2009 during a successful gravity assist. This flyby slowed Mars' orbital velocity by about 2.5 cm (1 in) per 180 million years. On this day, the spacecraft placed itself in safe mode, resulting in some data acquisition loss. The spacecraft was reported to be back in full operation two days later, with no impact on the subsequent mission identified. The root cause of the event was reported to be a software programming error. As Dawn approached Vesta, the Framing Camera instrument took progressively higher-resolution images, which were published online and at news conferences by NASA and MPI. On May 3, 2011, Dawn acquired its first targeting image, 1,200,000 km from Vesta, and began its approach phase to the asteroid. On June 12, Dawn's speed relative to Vesta was slowed in preparation for its orbital insertion 34 days later. Dawn was scheduled to be inserted into orbit at 05:00 UTC on July 16 after a period of thrusting with its ion engines. Because its antenna was pointed away from the Earth during thrusting, scientists were not able to immediately confirm whether or not Dawn successfully made the maneuver. The spacecraft would then reorient itself, and was scheduled to check in at 06:30 UTC on July 17. NASA later confirmed that it received telemetry from Dawn indicating that the spacecraft successfully entered orbit around Vesta. The exact time of insertion could not be confirmed, since it depended on Vesta's mass distribution, which was not precisely known and at that time had only been estimated. After being captured by Vesta's gravity and entering its orbit on July 16, 2011, Dawn moved to a lower, closer orbit by running its xenon-ion engine using solar power. On August 2, it paused its spiralling approach to enter a 69-hour survey orbit at an altitude of 2,750 km (1,710 mi). It assumed a 12.3-hour high-altitude mapping orbit at 680 km (420 mi) on September 27, and finally entered a 4.3-hour low-altitude mapping orbit at 210 km (130 mi) on December 8. In May 2012, the Dawn team published preliminary results of their study of Vesta, including estimates of the size of Vesta's metal-rich core, which is theorized to be 220 km (140 mi) across. The scientists stated that they think that Vesta is the "last of its kind" – the only remaining example of the large planetoids that came together to form the rocky planets during the formation of the Solar System. In October 2012, further Dawn results were published, on the origin of anomalous dark spots and streaks on Vesta's surface, which were likely deposited by ancient asteroid impacts. In December 2012, it was reported that Dawn had observed gullies on the surface of Vesta that were interpreted to have been eroded by transiently flowing liquid water. More details about the Dawn mission's scientific discoveries at Vesta are included on the Vesta page. Dawn was originally scheduled to depart Vesta and begin its two and a half year journey to Ceres on August 26, 2012. However, a problem with one of the spacecraft's reaction wheels forced Dawn to delay its departure from Vesta's gravity until September 5, 2012. During its time in orbit around Vesta, the probe experienced several failures of its reaction wheels. Investigators planned to modify their activities upon arrival at Ceres for close range geographical survey mapping. The Dawn team stated that they would orient the probe using a "hybrid" mode utilizing both reaction wheels and ion thrusters. Engineers determined that this hybrid mode would conserve fuel. On November 13, 2013, during the transit, in a test preparation, Dawn engineers completed a 27-hour-long series of exercises of said hybrid mode. On September 11, 2014, Dawn's ion thruster unexpectedly ceased firing and the probe began operating in a triggered safe mode. To avoid a lapse in propulsion, the mission team hastily exchanged the active ion engine and electrical controller with another. The team stated that they had a plan in place to revive this disabled component later in 2014. The controller in the ion propulsion system may have been damaged by a high-energy particle. Upon exiting the safe mode on September 15, 2014, the probe's ion thruster resumed normal operation. Furthermore, the Dawn investigators also found that, after the propulsion issue, Dawn could not aim its main communications antenna towards Earth. Another antenna of weaker capacity was instead temporarily retasked. To correct the problem, the probe's computer was reset and the aiming mechanism of the main antenna was restored. Dawn began photographing an extended disk of Ceres on December 1, 2014, with images of partial rotations on January 13 and 25, 2015 released as animations. Images taken from Dawn of Ceres after January 26, 2015, exceeded the resolution of comparable images from the Hubble Space Telescope. Because of the failure of two reaction wheels, Dawn made fewer camera observations of Ceres during its approach phase than it did during its Vesta approach. Camera observations required turning the spacecraft, which consumed precious hydrazine fuel. Seven optical navigation photo sessions (OpNav 1–7, on January 13 and 25, February 3 and 25, March 1, and April 10 and 15) and two full rotation observation sessions (RC1–2, on February 12 and 19) were planned[needs update] before full observation begins with orbital capture. The gap in March and early April was due to a period when Ceres appears too close to the Sun from Dawn's vantage point to take pictures safely. Dawn entered Ceres orbit on March 6, 2015, four months prior to the arrival of New Horizons at Pluto. Dawn thus became the first mission to study a dwarf planet at close range. Dawn initially entered a polar orbit around Ceres, and continued to refine its orbit. It obtained its first full topographic map of Ceres during this period. From April 23 to May 9, 2015, Dawn entered an RC3 orbit (Rotation Characterization 3) at an altitude of 13,500 km (8,400 mi). The RC3 orbit lasted 15 days, during which Dawn alternated taking pictures and sensor measurements and then relayed the resulting data back to Earth. On May 9, 2015, Dawn powered its ion engines and began a month-long spiral descent down to its second mapping point, a Survey orbit, three times closer to Ceres than the previous orbit. The spacecraft stopped twice to take images of Ceres during its spiral descent into the new orbit. On June 6, 2015, Dawn entered the new Survey orbit at an altitude of 4,430 km (2,750 mi). In the new Survey orbit, Dawn circled Ceres every three Earth days. The Survey phase lasted 22 days (7 orbits), and was designed to obtain a global view of Ceres with Dawn's framing camera, and generate detailed global maps with the visible and infrared mapping spectrometer (VIR). On June 30, 2015, Dawn experienced a software glitch when an anomaly in its orientation system occurred. It responded by going into safe mode and sending a signal to engineers, who fixed the error on July 2, 2015. Engineers determined the cause of the anomaly to be related to the mechanical gimbal system associated with one of Dawn's ion engines. After switching to a separate ion engine and conducting tests from July 14 through July 16, 2015, engineers certified the ability to continue the mission. On August 17, 2015, Dawn entered the HAMO orbit (High-Altitude Mapping Orbit). Dawn descended to an altitude of 1,480 km (920 mi), where in August 2015 it began the two-month HAMO phase. During this phase, Dawn continued to acquire near-global maps with the VIR and framing camera at higher resolution than in the Survey phase. It also imaged in stereo to resolve the surface in 3D. On October 23, 2015, Dawn began a two-month spiral toward Ceres to achieve a LAMO orbit (Low-Altitude Mapping Orbit) at a distance of 375 km (233 mi). Since reaching this fourth orbit in December 2015, Dawn was scheduled to acquire data for the next three months with its gamma-ray and neutron detector (GRaND) and other instruments that identified the composition at the surface. Having surpassed its mapping objectives, Dawn climbed to its fifth science orbit of 1,460 km (910 mi) beginning on September 2, 2016, to complete additional observations from a different angle. Dawn began raising its altitude to its sixth science orbit of 7,200 km (4,500 mi) on November 4, 2016, with a goal of reaching it by December 2016. The return to a higher altitude allowed for a second set of data at this altitude, which improves the overall science quality when added to the first batch. However, this time the spacecraft was placed where it was not spiraling and was orbiting in the same direction as Ceres, which reduced propellant consumption. A flyby of the asteroid 2 Pallas after the completion of the Ceres mission was suggested but never formally considered; orbiting Pallas would not have been possible for Dawn, due to the high inclination of Pallas' orbit relative to Ceres. In April 2016, the Dawn project team submitted a proposal to NASA for an extended mission that would have seen the spacecraft break orbit from Ceres and perform a flyby of the asteroid 145 Adeona in May 2019, arguing that the science gained from visiting a third asteroid might outweigh the returns from staying at Ceres. NASA's Planetary Mission Senior Review Panel, however, declined the proposal in May 2016. A one-year mission extension was approved, but the review panel ordered that Dawn remain at Ceres, stating that the long-term observations of the dwarf planet, particularly as it approached perihelion, would potentially yield better science. The one-year extension expired on June 30, 2017. The spacecraft was placed in an uncontrolled but relatively stable orbit around Ceres, where it ran out of hydrazine propellant on 1 November 2018, and where it will remain as a "monument" for at least 20 years. ^ a b c d McCartney, Gretchen; Brown, Dwayne; Wendel, JoAnna (September 7, 2018). "Legacy of NASA's Dawn, Near the End of its Mission". NASA. Retrieved September 8, 2018. ^ a b "GSpace Topics: Dawn". Planetary Society. Retrieved November 9, 2013. ^ a b c d "Dawn at Ceres" (PDF) (Press kit). NASA / Jet Propulsion Laboratory. March 2015. ^ a b c d e Rayman, Marc; Fraschetti, Thomas C.; Raymond, Carol A.; Russell, Christopher T. (April 5, 2006). "Dawn: A mission in development for exploration of main belt asteroids Vesta and Ceres" (PDF). Acta Astronautica. 58 (11): 605–616. Bibcode:2006AcAau..58..605R. doi:10.1016/j.actaastro.2006.01.014. Retrieved April 14, 2011. ^ a b c d e "Dawn". National Space Science Data Center. NASA. Retrieved November 20, 2016. ^ Brown, Dwayne C.; Vega, Priscilla (August 1, 2011). "NASA's Dawn Spacecraft Begins Science Orbits of Vesta". NASA. Retrieved August 6, 2011. ^ a b c d Rayman, Marc (April 8, 2015). Now Appearing At a Dwarf Planet Near You: NASA's Dawn Mission to the Asteroid Belt (Speech). Silicon Valley Astronomy Lectures. Foothill College, Los Altos, CA. Retrieved July 7, 2018. ^ a b "NASA's Dawn Spacecraft Hits Snag on Trip to 2 Asteroids". Space.com. August 15, 2012. Retrieved August 27, 2012. ^ a b "Dawn Gets Extra Time to Explore Vesta". NASA. April 18, 2012. Archived from the original on April 21, 2012. Retrieved April 24, 2012. ^ Landau, Elizabeth; Brown, Dwayne (March 6, 2015). "NASA Spacecraft Becomes First to Orbit a Dwarf Planet". NASA. Retrieved March 6, 2015. ^ Rayman, Marc (March 6, 2015). "Dawn Journal: Ceres Orbit Insertion!". Planetary Society. Retrieved March 6, 2015. ^ a b Grush, Loren (July 1, 2016). "NASA's Dawn spacecraft won't be leaving dwarf planet Ceres". The Verge. Retrieved June 19, 2017. ^ Landau, Elizabeth (October 19, 2017). "Dawn Mission Extended at Ceres". NASA. Retrieved October 19, 2017. ^ Northon, Karen (November 1, 2018). "NASA's Dawn Mission to Asteroid Belt Comes to End". NASA. Retrieved November 12, 2018. ^ Evans, Ben (October 8, 2017). "Complexity and Challenge: Dawn Project Manager Speaks of Difficult Voyage to Vesta and Ceres". AmericaSpace. Retrieved February 28, 2018. ^ "Glenn Contributions to Deep Space 1". NASA. Retrieved March 18, 2015. ^ Ronald J. Cybulski; Daniel M. Shellhammer; Robert R. LoveII; Edward J. Domino; Joseph T. Kotnik (1965). "RESULTS FROM SERT I ION ROCKET FLIGHT TEST, NASA Technical Note D2718" (PDF). Retrieved March 18, 2015. ^ "Innovative Engines – Glenn Ion Propulsion Research Tames the Challenges of 21st Century Space Travel". NASA. Archived from the original on September 15, 2007. Retrieved November 19, 2007. ^ a b Jim Taylor (August 2009). "Dawn Telecommunications" (PDF). NASA/JPL. Retrieved March 18, 2015. ^ a b c Susan Reichley (December 21, 2001). "2001 News Releases - JPL Asteroid Mission Gets Thumbs Up from NASA". Jpl.nasa.gov. Retrieved January 11, 2016. ^ "NASA announces Discovery mission finalists". Spacetoday.net. January 4, 2001. Retrieved January 11, 2016. ^ Ambrosiano, Nancy (March 28, 2006). "NASA's Dawn mission is a go". Los Alamos National Laboratory. Retrieved October 1, 2007. ^ Chang, Alicia (2006). "NASA Asteroid Mission Won't Launch This Year". Space.com. Retrieved March 4, 2006. ^ Clark, Stephen (2006). "Probe built to visit asteroids killed in budget snarl". SpaceflightNow.com. Retrieved March 4, 2006. ^ "NASA reviewing canceled mission". CNN.com. March 16, 2006. Archived from the original on March 21, 2006. Retrieved March 27, 2006. ^ Geveden, Rex (2006). "Dawn Mission Reclama" (PDF). Retrieved March 27, 2006. ^ Malik, Tariq (March 27, 2006). "NASA Reinstates Cancelled Asteroid Mission". Space.com. Retrieved March 27, 2006. ^ "Dawn". NASA – National Space Science Data Center. Retrieved July 16, 2011. ^ "DAWN Mission Objectives". NASA. Retrieved February 28, 2017. ^ Thomas B. McCord; Christophe Sotin (2005). "Ceres: Evolution and current state". Journal of Geophysical Research. 110 (E5): E05009. Bibcode:2005JGRE..11005009M. doi:10.1029/2004JE002244. ^ a b Calvin J. Hamilton. "Vesta". Retrieved January 6, 2013. ^ a b Thomas, P. C.; Parker, J. Wm. ; McFadden, L. A.; Russell, C. T.; Stern, S. A.; Sykes, M. V.; Young, E. F. (2005). "Differentiation of the asteroid Ceres as revealed by its shape". Nature. 437 (7056): 224–6. Bibcode:2005Natur.437..224T. doi:10.1038/nature03938. PMID 16148926. ^ "Meteoritical Bulletin Database". Retrieved November 27, 2014. ^ Ghosh, A; McSween, Harry Y. (1998). "A Thermal Model for the Differentiation of Asteroid 4 Vesta, Based on Radiogenic Heating". Icarus. 134 (2): 187–206. Bibcode:1998Icar..134..187G. doi:10.1006/icar.1998.5956. ^ a b c d "Mission Objectives". JPL – NASA. 2006. Retrieved March 23, 2013. ^ "Dawn Mission Overview". NASA. Retrieved August 17, 2014. ^ Scott W. Benson (November 8, 2007). "Solar Power for Outer Planets Study" (PDF). NASA. Retrieved November 27, 2014. ^ "Dawn Mission". NASA – JPL. Retrieved July 18, 2011. ^ "Dawn, Ion Propulsion". NASA. Retrieved September 28, 2007. ^ "Dawn, Spacecraft". NASA. Retrieved September 28, 2007. ^ "Dawn Solar Arrays". Dutch Space. 2007. Retrieved July 18, 2011. ^ a b Garner, Charles E.; Rayman, Mark M.; Whiffen, Greg J.; Brophy, John R.; Mikes, Steven C. (February 10, 2013). Ion propulsion: An enabling technology for the Dawn Mission. 23rd AAS/AIAA Spaceflight Mechanics Meeting. Kauai, Hawaii: Jet Propulsion Laboratory, National Aeronautics and Space Administration. hdl:2014/44151. ^ Watanabe, Susan (July 5, 2007). "Dawn: Spacecraft & Instruments". NASA. Retrieved August 10, 2006. ^ "Dawn Lifts Off". National Geographic Society. Retrieved September 28, 2007. ^ "NSSDC - Spacecraft - Details". NASA. 2007. Retrieved January 22, 2015. ^ "Dawn Mission | Mission". dawn.jpl.nasa.gov. Retrieved November 24, 2018. ^ "All Aboard the Dawn Spacecraft". JPL – NASA. May 20, 2007. Retrieved May 21, 2007. ^ "Send Your Name to the Asteroid Belt". JPL.NASA.gov. November 4, 2006. Archived from the original on April 11, 2007. Retrieved June 21, 2007. ^ "Kennedy Media Gallery". NASA. May 17, 2007. Archived from the original on October 21, 2007. Retrieved June 21, 2007. ^ a b "Dawn Spacecraft and Instruments". Retrieved August 17, 2014. ^ a b c d Sierks, H.; Aye, K.-M.; Büttner, I.; Enge, R.; Goetz, W.; et al. (2009). Dawn Framing Camera: A Telescope En Route To The Asteroid Belt (PDF). 1st EIROforum School of Instrumentation. May 11-15, 2009. Geneva, Switzerland. ^ Sierks, H.; Keller, H. U.; Jaumann, R.; Michalik, H.; Behnke, T.; Bubenhagen, F.; Büttner, I.; Carsenty, U.; et al. (2011). "The Dawn Framing Camera". Space Science Reviews. 163 (1–4): 263–327. Bibcode:2011SSRv..163..263S. doi:10.1007/s11214-011-9745-4. ^ Sanctis, M. C.; Coradini, A.; Ammannito, E.; Filacchione, G.; Capria, M. T.; Fonte, S.; Magni, G.; Barbis, A.; et al. (2010). "The VIR Spectrometer". Space Science Reviews. 163 (1–4): 329–369. Bibcode:2010SSRv..tmp..103D. doi:10.1007/s11214-010-9668-5. ^ "Science Payload". NASA. Archived from the original on May 27, 2010. Retrieved March 21, 2010. ^ "GRaND science instrument moves closer to launch from Cape". NASA. Archived from the original on May 21, 2011. Retrieved March 21, 2010. ^ Righter, Kevin; Drake, Michael J. (1997). "A magma ocean on Vesta: Core formation and petrogenesis of eucrites and diogenites". Meteoritics & Planetary Science. 32 (6): 929–944. Bibcode:1997M&PS...32..929R. doi:10.1111/j.1945-5100.1997.tb01582.x. ^ Drake, Michael J. (2001). "The eucrite/Vesta story". Meteoritics & Planetary Science. 36 (4): 501–513. Bibcode:2001M&PS...36..501D. doi:10.1111/j.1945-5100.2001.tb01892.x. ^ Prettyman, Thomas H. (2004). "Proceedings of SPIE—Mapping the elemental composition of Ceres and Vesta: Dawn's gamma ray and neutron detector" (PDF). Instruments, Science, and Methods for Geospace and Planetary Remote Sensing. 5660: 107. doi:10.1117/12.578551. ^ Prettyman, T.H. (August 2003). "Gamma-ray and neutron spectrometer for the Dawn mission to 1 Ceres and 4 Vesta". IEEE Transactions. 50 (4): 1190–1197. Bibcode:2003ITNS...50.1190P. doi:10.1109/TNS.2003.815156. ^ Oberg, James (September 27, 2007). "Spacecraft's ion drive gets its day in the sun". NBC News. Retrieved November 25, 2018. ^ "Dawn arrives in Florida". Spaceflight Now. April 2007. Retrieved June 28, 2013. ^ "Dawn at Astrotech's Payload Processing Facility". Space and Astronautics News. April 11, 2007. Archived from the original on September 27, 2007. Retrieved June 28, 2013. ^ "Launch of Dawn asteroid mission postponed again". New Scientist. 2007. Retrieved June 28, 2013. ^ "Expendable Launch Vehicle Status Report". NASA. June 18, 2007. Retrieved June 28, 2013. ^ "NASA Mission to Asteroid Belt Rescheduled for September Launch". NASA. July 7, 2007. Retrieved November 9, 2013. ^ "Dawn Launch Date". NASA launch schedule. Retrieved September 1, 2007. ^ Russell, Christopher; Raymond, Carol, eds. (2012). The Dawn Mission to Minor Planets 4 Vesta and 1 Ceres. New York: Springer Science+Business Media. doi:10.1007/978-1-4614-4903-4. ISBN 978-1-4614-4903-4. ^ "Expendable Launch Vehicle Status Report". NASA. September 7, 2007. Retrieved November 9, 2013. ^ "NASA's Launch Blog". NASA. September 27, 2007. Retrieved November 9, 2013. ^ "Expendable Launch Vehicle Status Report". NASA. May 11, 2007. Retrieved November 9, 2013. ^ "ULA—One Team for Assured Access to Space" (PDF). ulalaunch.com. Archived from the original (PDF) on September 28, 2007. Retrieved November 9, 2013. ^ "NASA's Launch Coverage". NASA. September 27, 2007. Retrieved November 9, 2013. ^ "Dawn Spacecraft Successfully Launched". NASA. September 27, 2007. Retrieved November 9, 2013. ^ "Dawn Journal". Jet Propulsion Laboratory. September 12, 2007. Retrieved July 21, 2014. ^ Rayman, Marc D. (August 24, 2008). "Dear Dawnivores". Retrieved November 9, 2013. ^ Rayman, Marc D. "Dawn Journal: December 17, 2007". JPL. Retrieved November 9, 2013. ^ Rayman, Marc D. "Dawn Journal: Aiming away from a bull's eye at Mars". The Planetary Society. Archived from the original on July 16, 2011. Retrieved November 9, 2013. ^ Malik, Tariq (February 18, 2009). "Asteroid-Bound Probe Zooms Past Mars". Space.com. Retrieved November 9, 2013. ^ "Dawn Receives Gravity Assist from Mars". NASA/JPL. February 28, 2009. Retrieved January 9, 2018. ^ a b c Clark, Stephen (July 2, 2016). "Pluto probe's extended mission approved, but new Dawn destination denied". Spaceflight Now. Retrieved June 21, 2017. ^ "NASA's Dawn Captures First Image of Nearing Asteroid". NASA. May 11, 2011. Retrieved September 1, 2012. ^ "NASA'S Dawn Spacecraft Begins Science Orbits Of Vesta". NASA. August 1, 2011. Retrieved August 7, 2014. ^ "View of Vesta from Dawn". NASA/JPL MYSTIC simulator (updated periodically). Retrieved September 1, 2012. ^ Wall, Mike (July 16, 2011). "NASA Spacecraft Now Orbiting Huge Asteroid Vesta ... Hopefully". Space.com. Retrieved July 17, 2011. ^ Amos, Jonathan (July 17, 2011). "Dawn probe orbits asteroid Vesta". BBC. Retrieved January 22, 2015. ^ Vega, Priscilla; Brown, Dwayne (July 16, 2011). "NASA's Dawn Spacecraft Enters Orbit Around Asteroid Vesta". NASA. Retrieved July 17, 2011. ^ a b Russell, C. T.; Raymond, C. A.; Coradini, A.; McSween, H. Y.; Zuber, M. T.; et al. (May 11, 2012). "Dawn at Vesta: Testing the Protoplanetary Paradigm". Science. 336 (6082): 684–686. Bibcode:2012Sci...336..684R. doi:10.1126/science.1219381. PMID 22582253. ^ Rayman, Marc (2011). "Mission Status Updates". NASA / Jet Propulsion Laboratory. ^ Russell, C. T.; Raymond, C. A. (December 2011). "The Dawn Mission to Vesta and Ceres". Space Science Reviews. 163 (1–4): 3–23. Bibcode:2011SSRv..163....3R. doi:10.1007/s11214-011-9836-2. ^ Garner, Charles E.; Rayman, Marc D.; Brophy, John R.; Mikes, Steven C. (2011). The Dawn of Vesta Science (PDF). 32nd International Electric Propulsion Conference. September 11–15, 2011. Wiesbaden, Germany. IEPC-2011-326. ^ Amos, Jonathan (May 11, 2012). "Asteroid Vesta is 'last of a kind' rock". BBC News. Retrieved January 20, 2015. ^ Waugh, Rob (May 15, 2012). "Incredible video 'fly-over' by Nasa's Dawn probe reveals huge rippled asteroid Vesta is more like a small planet". Daily Mail. Retrieved May 23, 2012. ^ Reddy, Vishnu; Le Corre, Lucille; O'Brien, David P.; Nathues, Andreas; Cloutis, Edward A.; et al. (November – December 2012). "Delivery of dark material to Vesta via carbonaceous chondritic impacts". Icarus. 221 (2): 544–559. arXiv:1208.2833. Bibcode:2012Icar..221..544R. doi:10.1016/j.icarus.2012.08.011. ^ McCord, T. B.; Li, J.-Y. ; Combe, J.-P.; McSween, H. Y.; Jaumann, R.; et al. (November 2012). "Dark material on Vesta from the infall of carbonaceous volatile-rich material". Nature. 491 (7422): 83–86. Bibcode:2012Natur.491...83M. doi:10.1038/nature11561. PMID 23128228. ^ Paladino, James (October 31, 2012). "NASA's Dawn Spacecraft Probes Proto-Planet Vesta, Discovers Deposits that Give Scientists Insight into the Origins of the Solar System". Latinos Post. Retrieved November 28, 2012. ^ Scully, J. E. C.; Russell, C. T.; Yin, A.; Jaumann, R.; Carey, E.; et al. (2014). Sub-Curvilinear Gullies Interpreted as Evidence for Transient Water Flow on Vesta (PDF). 45th Lunar and Planetary Science Conference. March 17–21, 2014. The Woodlands, Texas. Bibcode:2014LPI....45.1796S. ^ Amos, Jonathan (December 6, 2012). "Dawn probe spies possible water-cut gullies on Vesta". BBC News. Retrieved December 8, 2012. ^ Aron, Jacob (September 6, 2012). "Dawn departs Vesta to become first asteroid hopper". New Scientist. Short sharp Science. Retrieved November 9, 2013. ^ Cook, Jia-Rui C. (August 18, 2012). "Dawn Engineers Assess Reaction Wheel". NASA / Jet Propulsion Laboratory. Archived from the original on March 15, 2015. Retrieved January 22, 2015. ^ Cook, Jia-Rui C. (September 5, 2012). "Dawn has departed the giant asteroid Vesta". NASA / Jet Propulsion Laboratory. Archived from the original on April 14, 2015. ^ "NASA's Dawn Spacecraft Says Goodbye to Giant Asteroid Vesta". Space.com via Yahoo! News. September 5, 2012. Retrieved September 6, 2012. ^ a b Williams, David A.; Yingst, R. Aileen; Garry, W. Brent (December 2014). 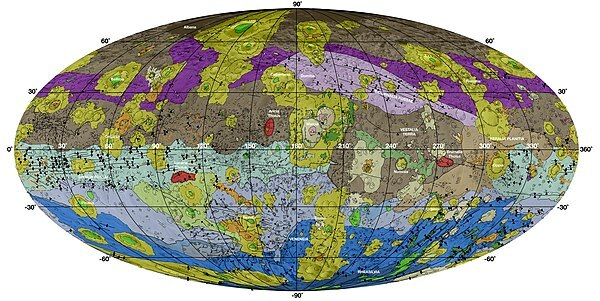 "Introduction: The geologic mapping of Vesta". Icarus. 244: 1–12. Bibcode:2014Icar..244....1W. doi:10.1016/j.icarus.2014.03.001. hdl:2286/R.I.28071. ^ Scully, J. E. C.; Yin, A.; Russell, C. T.; Buczkowski, D. L.; Williams, D. A.; et al. (December 2014). "Geomorphology and structural geology of Saturnalia Fossae and adjacent structures in the northern hemisphere of Vesta". Icarus. 244: 23–40. Bibcode:2014Icar..244...23S. doi:10.1016/j.icarus.2014.01.013. hdl:2286/R.I.28070. ^ Schäfer, M.; Nathues, A.; Williams, D. A.; Mittlefehldt, D. W.; Le Corre, L.; et al. (December 2014). "Imprint of the Rheasilvia impact on Vesta – Geologic mapping of quadrangles Gegania and Lucaria". Icarus. 244: 60–73. Bibcode:2014Icar..244...60S. doi:10.1016/j.icarus.2014.06.026. hdl:2286/R.I.28060. ^ Kneissl, T.; Schmedemann, N.; Reddy, V.; Williams, D. A.; Walter, S. H. G.; et al. (December 2014). "Morphology and formation ages of mid-sized post-Rheasilvia craters – Geology of quadrangle Tuccia, Vesta". Icarus. 244: 133–157. Bibcode:2014Icar..244..133K. doi:10.1016/j.icarus.2014.02.012. hdl:2286/R.I.28058. ^ "Dawn Journal February 25". NASA. February 25, 2015. Retrieved March 1, 2015. ^ "Dawn Fills out its Ceres Dance Card". NASA/JPL. December 3, 2013. Archived from the original on April 15, 2015. Retrieved March 18, 2015. ^ a b "Dawn Operating Normally After Safe Mode Triggered". NASA/JPL. September 16, 2014. Archived from the original on December 25, 2014. Retrieved March 18, 2015. ^ "Dawn Journal". NASA/JPL. December 29, 2014. Retrieved January 21, 2015. ^ "Dawn Journal October 31". NASA. October 31, 2014. Archived from the original on January 20, 2015. Retrieved January 18, 2015. ^ "Dawn Journal January 29". NASA. January 29, 2015. Retrieved February 13, 2015. ^ Rayman, Marc (March 31, 2015). "Dawn Journal March 31 ". NASA / Jet Propulsion Laboratory. Archived from the original on September 5, 2015. Retrieved September 9, 2015. ^ Rayman, Marc (July 30, 2015). "Dawn Journal: Descent to HAMO". The Planetary Society. Retrieved September 9, 2015. ^ "PIA21221: Dawn XMO2 Image 1". NASA / Jet Propulsion Laboratory. November 7, 2016. Retrieved November 20, 2016. ^ a b c "Dawn Mission Status Updates". NASA / Jet Propulsion Laboratory. October 16, 2015. Retrieved October 17, 2015. ^ Rayman, Marc (November 28, 2016). "Dawn Journal: November 28, 2016". NASA / Jet Propulsion Laboratory. Retrieved December 30, 2016. ^ Rayman, Marc (December 29, 2016). "Dawn Journal: December 29, 2016". NASA / Jet Propulsion Laboratory. Retrieved December 30, 2016. ^ a b Rayman, Marc (2017). "2017 Mission Status Updates". NASA / Jet Propulsion Laboratory. ^ Rayman, Marc (May 25, 2018). "Dawn Journal: Getting Elliptical". The Planetary Society. Retrieved June 5, 2018. ^ Rayman, Marc (March 20, 2018). "Dear Vernal Dawnquinoxes". NASA. Retrieved June 5, 2018. ^ Rayman, Marc (2018). "2018 Mission Status Archive". NASA / Jet Propulsion Laboratory. ^ Rayman, Marc (August 9, 2018). "Dawn - Mission Status". NASA. Retrieved September 12, 2018. ^ Clark, Stephen (June 15, 2018). "Dawn spacecraft flying low over Ceres". SpaceFlightNow.com. Retrieved June 16, 2018. ^ Kornfeld, Laurel (June 2, 2018). "Dawn will enter lowest ever orbit around Ceres". Spaceflight Insider. Retrieved June 5, 2018. ^ Rayman, Marc (April 29, 2018). "Dear Isaac Newdawn, Charles Dawnwin, Albert Einsdawn and all other science enthusiasts". NASA. Retrieved June 5, 2018. ^ Boyle, Alan (March 6, 2015). "Dawn Spacecraft Slips Quietly Into Orbit Around Dwarf Planet Ceres". NBC News. Retrieved March 11, 2015. ^ Cook, Jia-Rui (December 3, 2013). "NASA's Dawn Fills out its Ceres Dance Card". NASA / Jet Propulsion Laboratory. Retrieved December 8, 2013. ^ McCord, Thomas B.; Castillo-Rogez, Julie; Rivkin, Andy (2012). "Ceres: Its Origin, Evolution and Structure and Dawn's Potential Contribution". The Dawn Mission to Minor Planets 4 Vesta and 1 Ceres. Springer New York. pp. 63–76. doi:10.1007/978-1-4614-4903-4_5. ISBN 978-1-4614-4902-7. ^ Lakdawalla, Emily (March 19, 2015). "LPSC 2015: First results from Dawn at Ceres: provisional place names and possible plumes". The Planetary Society. Retrieved March 21, 2015. ^ Rayman, Marc (February 28, 2014). "Dawn Journal February 28". NASA / Jet Propulsion Laboratory. Retrieved February 13, 2015. ^ Landau, Elizabeth (May 11, 2015). "Ceres Animation Showcases Bright Spots". NASA / Jet Propulsion Laboratory. Retrieved May 13, 2015. ^ Landau, Elizabeth (July 17, 2015). "Dawn Maneuvering to Third Science Orbit". NASA / Jet Propulsion Laboratory. Retrieved July 20, 2015. ^ Trembley, Bob (August 21, 2015). "Dawn Mission Enters High Altitude Mapping Orbit Over Ceres". The Catholic Astronomer. Vatican Observatory. Retrieved August 28, 2015. ^ Landau, Elizabeth (August 31, 2016). "Dawn Sets Course for Higher Orbit". NASA / Jet Propulsion Laboratory. Retrieved November 20, 2016. ^ Landau, Elizabeth (November 18, 2016). "New Ceres Views as Dawn Moves Higher". NASA / Jet Propulsion Laboratory. Retrieved November 20, 2016. ^ "Dawn Journal December 29". NASA/JPL. January 11, 2015. Retrieved March 10, 2015. ^ Schilling, Govert (April 20, 2016). "NASA's Dawn probe may visit third asteroid after Ceres and Vesta". New Scientist. Retrieved April 24, 2016. ^ McCuistion, J. Douglas (June 17, 2016). "Report for Planetary Mission Senior Review 2016" (PDF). NASA. ^ Clark, Stephen (June 17, 2017). "Dawn mission managers await NASA decision on spacecraft's future". Spaceflight Now. Retrieved June 19, 2017. ^ Rayman, Marc D. (September 27, 2017). "Dawn Journal". NASA / Jet Propulsion Laboratory. ^ a b Brown, Dwayne; Wendel, JoAnna; McCartney, Gretchen (September 6, 2018). "The Legacy of NASA's Dawn, Near End of Mission". NASA. Retrieved November 2, 2018. ^ a b Brown, Dwayne; Wendel, JoAnna; McCartney, Gretchen (November 1, 2018). "NASA's Dawn Mission to Asteroid Belt Comes to End". NASA. Retrieved November 2, 2018. ^ a b Chang, Kenneth (November 1, 2018). "NASA's Dawn Mission to the Asteroid Belt Says Good Night - Launched in 2007, the spacecraft discovered bright spots on Ceres and forbidding terrain on Vesta". The New York Times. Retrieved November 2, 2018. Wikimedia Commons has media related to Dawn (spacecraft). Dawn Legacy – Video (03:04) by NASA (September 7, 2018).